Updated: 2012-05-15. Something not right? Please update the information. Hiking trails, formal campfire circle, chapel, obstacle course, pioneering supplies, archery, sledding, bouldering, sports field, fishing. Everton Scout Forest is part of the longest continuous cedar forest in Ontario. The forest is dotted with Adirondack shelters and small cabins. A swinging bridge and stepping stones cross the Eramosa River to mixed forests. The area features limestone cliffs and glacial potholes. 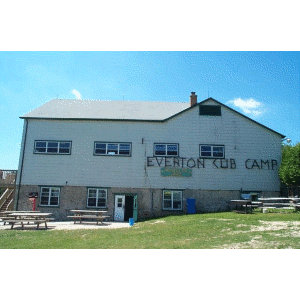 Camp Everton is also the location of the Ted Claxton Memorial Outhouse. Everton Cub Camp features several heated cabins and Wheeler Lodge, the Cub barn. The barn has accommodation for over 100 people, indoor washrooms, showers, electricity, and a commercial kitchen. Firewood is available on site. No wood may be brought to the camp. This rule is to prevent the infection of the camp by emerald ash borers or Asian longhorn beetles.